Wreckage from the President's plane can be seen on the other side of the wall. 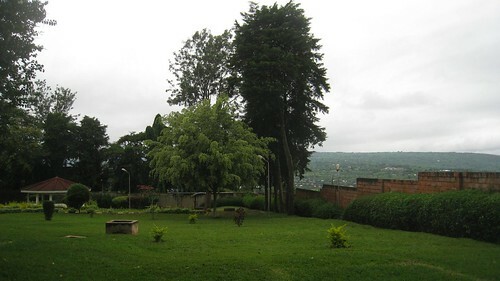 On the morning of my last day in Rwanda, I visited the old home of former President Juvenal Hayarimana. When his plane was shot down over the compound in 1994, killing him and the president of Burundi, it was the spark needed to usher in the genocide. It was both eery and interesting to walk through a former president's home, especially one who had been assassinated so recently. Photos were not allowed. While the walls were bare, there were still quite a few large pieces of furniture, including the master bedroom set. When I walked into the master bathroom, it was spacious with a large jacuzzi tub in one corner, and a toilet on an elevated platform. Because it was elevated, the toilet had the aire of a throne. Naturally, I assumed it belonged to the president, however the guide said the space was actually for the first lady, and that the narrow, closet-sized space which adjoined it was for the President. I'm not kidding, it was just wide enough to fit a toilet on one end and a standard shower/bath on the other, with a sink in the middle! After touring the interior of the home, we walked out back through the gardens, which included an empty pool, and a tennis court. I'd heard it was possible to see actual wreckage from the plane, and while again I could not take photos, I was able to see it in person from a small guard tower situated atop one of the compound's walls. The tour cost no more than a few dollars, and I'd highly recommend it if you have a few hours to spare in Kigali.